This Sterling Silver Bracelet is Channel Inlaid with Lovely Blue Gem Turquoise. It was Handmade by Navajo Silversmith Ambrose Lincoln. Ambrose Lincoln was born in 1917 and graduated from Wingate Vocational High School in 1939. 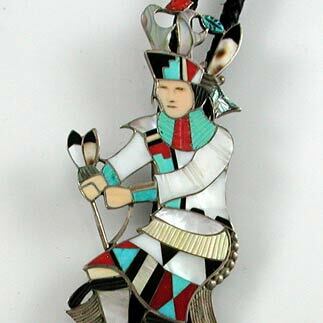 He worked as the silversmithing instructor at Santa Fe Indian School in 1942. Lincoln worked primarily in the Gallup area in the 1940s for C.G. Wallace and Charles Kelsey. Ambrose Lincoln died in 1989 and is buried in Gallup, NM.